Simone Boyce, B.S. Telecommunication 2010, is a reporter and host for a new streaming network at NBC News and MSNBC. She will host “Space is Awesome,” a special report focusing on space history and popular culture. The special is part of NBC News Digital’s experimentation with programming for a video streaming news network to reach a broader range of consumers. Boyce is a veteran reporter and has worked at various media outlets since graduation. 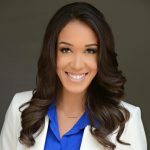 Before joining NBC News, she served as a reporter at KTLA 5 News in Los Angeles and as a correspondent for Mic.